Once Drew started solid foods, his diapers started having ammonia issues. Some ammonia smell is expected (it's the pee breaking down). The smell is "ok" if it's coming from an overnight diaper or from the wet bag of dirty diapers. If the smell is coming from a diaper that's only been on for an hour or so, that's not ok (which was where we were at). When Drew's diaps started to get the dreaded ammonia smell, I hit the internet for answers. I'm in a few cloth diaper groups on Facebook, so I did some searching there as well. It turns out, there are more opinions on how to wash your cloth diapers than there are on how (or if) to sleep train your baby. It's insane, and nearly impossible to determine if there is any truly "right" way to wash your diapers. So, I defaulted to the diaper manufacture instructions, and the advice of the makers of Charlie's Soap (which is the soap we use for the diapers). I then stripped all the diapers, and started with the new wash routine. *I figured out that if I turn on the hot water in the bathroom faucet next the laundry room before starting step 2, it pulls the hot water over to the far side of the house (where the washing machine is). That way, the water is immediately hot going into the washing machine. It's makes a difference! Once a month, I do a vinegar or bleach wash to ensure the diapers are getting properly sanitized. Charlie's soap cleans, but doesn't sanitize. The hot water does a good enough job at sanitizing, but the monthly vinegar our bleach wash really does the trick. He's only had one major diaper rash in his life (right before I figured out how to deal with the ammonia issues), so I'm confident - at least for now - that his diapers are getting clean with this new wash routine. I've also (very) slowly been adding to my stash when I see good deals (like on Zulily). I don't usually like the inserts that come with other brands, so I recently got a 6 pack of BG inserts to use with the new shells I've been gathering up. We now have a total of 18 diapers, and Drew averages 7-8 diapers a day, so I do cloth diaper laundry usually every other day. It's not ideal to let the dirty diapers just hang out for days on end in the wet bag, so every other day is a good rhythm even if you have a huge stage (or so I've been told). Lastly, we got a diaper sprayer, and we like it - but not for it's actual intended purpose. Bum Genius Diaper Sprayer. Do not pay full price for one of these! They are always at consignment shops and/or on Craiglist. I made the mistake of trying to use the diaper sprayer to actually spray poo into the toilet...no! Wrong! The water comes out of the sprayer with such force that fresh baby poo goes everywhere. Not cool, diaper sprayer! It's should be called a poo sprayer. Anyway, we actually use the diaper sprayer to rinse the urine out of the overnight diaper inserts (because they're usually soaked, and the biggest culprit for ammonia smell). I just drop the inserts onto the floor of the tub, and then blast them with the diaper sprayer. Side note: the front of the sprayer somehow looks like it should be the back, and both Kyle and I agree on this as we have both sprayed ourselves in the face with toilet water several times. Kyle told me it's not actually toilet water coming out of the sprayer, but since the sprayer is attached to the toilet, it still grosses me out when I get any water from the sprayer on me (let alone my face at 7:30 in the morning). Ok, so once I've sprayed the overnight inserts, I just drop them into the wet bag. As for the poo? I picked up a box of cloth diaper disposable liners at Babies R Us. Drew almost always poos in the morning before his first nap, so we just stick a liner into that diaper. The liner catches the poo, making for easy disposal and clean up. The one final change I made is that I no longer pre-stuff the diapers with their inserts. I just keep a pile of shells and a pile of inserts in his top drawer. For whatever reason, we just found it's easier to stuff them as we go. So there you have it! I'm still loving cloth diapering, and plan on doing it with future children. I'm always curious to hear about other diaper brands, wash routines, etc, so don't be shy! 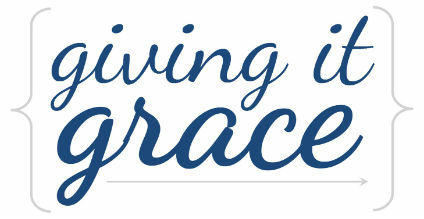 Giving it grace: I'm going to keep this one simple. Every time I clean up Drew's waste product, it reminds me that God is continually cleaning up my waste product as well (my sinful thoughts and actions). Whereas I grow tired of dealing with Drew's crap, God never grows tired of dealing with mine...because His love is perfect. Diaper after diaper, His love is perfect. i can't stop laughing at the water spray-to the face mental image. the rest sounds like you've worked out all the kinks! i'll be here lol'ing in my office like a weirdo, if you need me.